The particles from smoldering ponderosa pines are captured and studied using a new methodology devised by scientists at Pacific Northwest National Laboratory. The new method detected numerous organic compounds that were previously unreported. Results: As trees and underbrush burn, billowing smoke made up of tiny particles drifts away. To understand how that smoke will impact the people and environment, three scientists at Pacific Northwest National Laboratory devised a new method that provides highly detailed information about the smoke's composition. For example, they found that when ponderosa pines smolder, they emit alkaloids or N-heterocyclic organic compounds. Alkaloids may affect the environment in a variety of ways. Depending on their composition, they can either be toxic or essential nutrients for different organisms, thereby impacting ecosystems and human health in the areas subjected to forest fires. Why it matters: Every year, ponderosa wildfires occur up and down the West Coast. Some fires are accidental, caused by lightening strikes or carelessness, while others are prescribed activities at military bases and in national forests. The composition of the smoke must be understood to assess its impacts on the health of populations and the environment downwind from these fires. 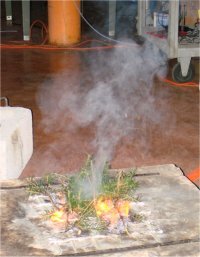 Methods: Two years ago, the team began devising a new approach to study particles obtained from smoldering ponderosa pine fires at the Fire Sciences Laboratory. First, they prepared and analyzed samples using a sophisticated high-resolution electrospray ionization mass spectrometer. The instrument, known as the LTQ Orbitrap mass spectrometer for environmental research, is in the Department of Energy's EMSL, a national scientific user facility at PNNL. Next, the team conducted comprehensive data analysis to determine elemental composition of a variety of features observed in mass spectra. Finally, they did extensive comparisons with scientific literature. They determined that 70% of the species they detected were not previously reported. "The research significantly expanded the previous observations," said Dr. Alexander Laskin, an aerosol chemist at PNNL. Of interest were the alkaloids found in the smoke. Alkaloids are naturally occurring chemical compounds containing nitrogen atoms. Depending on their composition, alkaloids can affect the environment in different ways, providing essential nutrients to some organisms, but poisoning others. These changes to the environment can impact human health, aquatic, and terrestrial ecosystems. In addition, alkaloid compounds with a basic pH can modulate the acidity of cloud-forming particles. Changing particle acidity affects the chemistry and the composition of the particles. These changes can impact cloud formation, critical to global agriculture and water supplies. What's next: Dr. Alexander Laskin and Dr. Julia Laskin are refining the methodology to provide more detailed information about the quantity of the particles and their chemical composition. Acknowledgments: This research was performed by Jeffrey Smith, an undergraduate from the University of Washington; and Alexander Laskin and Julia Laskin from PNNL. Smith worked on the research as an undergraduate researcher participating in the DOE Science Undergraduate Laboratory Internship or SULI program at PNNL. The research was done at DOE's EMSL, a national scientific user facility at PNNL. The samples came from the US Department of Agriculture/US Forest Service Fire Sciences Laboratory in Missoula, Montana. The DOE Office of Basic Energy Sciences and Office of Biological and Environmental Research, along with the Science Undergraduate Laboratory Internship program, funded the research. References: Smith JS, A Laskin, and J Laskin. 2009. "Molecular Characterization of Biomass Burning Aerosols Using High Resolution Mass Spectrometry." Analytical Chemistry 81:1512-1521. Laskin A, J Smith, and J Laskin. 2009. "Molecular Characterization of Nitrogen Containing Organic Compounds in Biomass Burning Aerosols Using High Resolution Mass Spectrometry." Environmental Science and Technology. ASAP. The composition of particles from fires depends on the type of fuel, the moisture content of the air, and the temperature. Also, the type of fire matters. Smoldering fires, such as those from planned burns, generate different particles than the more dramatic wildfires, such as those seen on the news fanned by the infamous Santa Ana winds.